Preheat oven to 350 degrees. Line 20 standard muffin tins with paper liners. 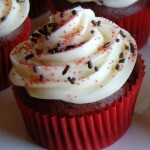 CUPCAKES: In a large bowl, whisk together cake flour, cocoa, and salt, set aside. Using a hand or stand mixer, beat together butter and sugar until light and fluffy, about three minutes. Add eggs, one at a time, then beat in food color and vanilla, scraping down the bowl with a spatula as you go. Add one third of the flour mixture to the butter mixture, beat well, then beat in half of the buttermilk. Beat in another third of flour mixture, then second half of buttermilk. End with the last third of the flour mixture, beat until well combined, making sure to scrape down the bowl with a spatula. In a small bowl, stir together the baking soda and vinegar (it will foam), add mixture to the batter, and mix on medium speed for 10 seconds. Divide batter evenly among lined cups, filling each three-quarters full. Bake, rotating tins halfway through, until a tooth pick inserted in centers comes out clean, about 20 minutes. 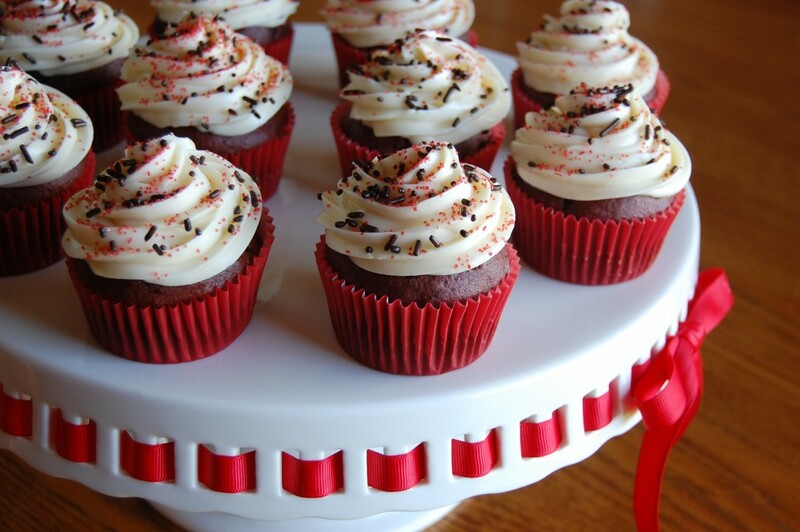 To finish, spread or pipe cupcakes with cream cheese frosting. Garnish with sprinkles or fresh strawberries. Refrigerate up to 3 days in airtight containers, bring to room temperature before serving. CREAM CHEESE FROSTING: With an electric mixer, beat together cream cheese and butter until smooth. Turn mixer to low speed and blend in confectioners' sugar, salt and vanilla extract. Turn mixer on high and beat until light and fluffy. Use immediately or refrigerate, covered, until ready to use. If refrigerated, the frosting will need to be brought to room temperature before using.